Unusual and interesting case of a primary small bowel carcinoid tumor recently. This was an older guy who had been diagnosed with a low grade lymphoma 5 or 6 years prior to our encounter. He presented to the ER with a high grade small bowel obstruction and renal failure secondary to dehydration. He'd never had an abdominal operation before and there were no obvious incarcerated abodominal wall hernias on exam. In that scenario, any halfway decent clinician ought to be worried about an underlying neoplastic cause of the obstruction, especially given a history of lymphoma as in this particular patient. 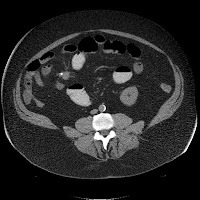 The CT scan above demonstrates a patially calcified mass in the mesentery of the small bowel, very close to the terminal end of the superior mesenteric artery. I explored him and excised a segment of ileum that had 7 separate carcinoid tumors. Then I basically shaved this mass off the distal SMA/ileocolic artery. Most of the lymph nodes in the mesentery had been totally replaced by metastatic carcinoid tumor but the intestinal margins were clean. Carcinoid tumors are an odd ball in surgical oncology. Overall they are rather rare, but they are the most common tumors seen in the appendix and the second most common cancer seen in small intestinal malignancies. They derive from neuroendocrine tissue and can secrete hormonally active substances (serotonin/kallikrein) that can cause what is known as the "carcinoid syndrome", an uncommon presentation that includes such symptoms as flushing, diarrhea, bronchoconstriction, cardiac valvular lesions, and telangiectasia. Carcinoid tumors also tend to be multicentric, so make sure you run the entire length of the intestinal tract when you've got that abdomen open; 30% of the time you'll find another one. They also have a tendency to incite a severe desmoplastic reaction in the surrounding tissues. Mesenteric deposits near major blood vessels (SMA) can sometimes encase themselves in a hard, fibrotic shell, making safe resection hazardous, if not impossible. recently did a "small bowel mass" that i thought would be a carcinoid. at operation the guy had a malrotation and the mass was in the appendix area. the jury (pathologist) is still out about diagnosis. About 5 years ago we had a SBO at the duodenum-ligament of Treitz that turned out to be metastatic carcinoid wrapped around the SMA; we corrected the obstruction; since further surgery was impossible we placed the patient on depo sandostatin - he is alive and doing well today - except for diabetes. Was the sandostatin given for symptoms of carcinoid syndrome or was it given as adjuvant therapy for disease control?